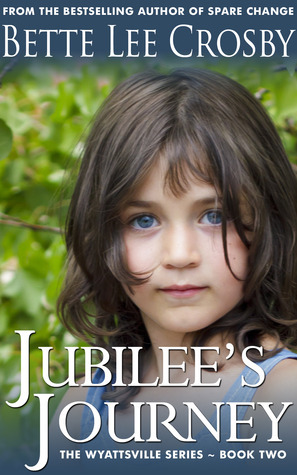 Jubilee's Journey is the second book in the Wyattsville series by Bette Lee Davis. When I had finished Spare Change (#1) I thought that I had seen the last of Olivia and Ethan Allen and that outstanding Detective Jack Mahoney. Not so, while this book is not totally about them, it does include them and that in itself immediately hooked me in. This story really belongs to Jubilee and her big brother Paul. They come from a small mining town where they have lost both parents. Paul is like a mother and father and whole family to Jubilee, no one has had a better bigger brother. They arrive in Wyattsville seeking their Aunt - Anita their mother's sister. Before they can begin their search Jubilee and Paul are separated and Paul finds himself in the clutches of the police. He just happened to be in the wrong place at the wrong time and with nobody to vouch for him. Fortunately for Jubilee she is found by Ethan Allen and eventually lands home with him and Olivia. Ethan soon takes over the role of big brother much to his grandma Olivia's delight. Olivia drags Jack Mahoney into the whole mess and there is no one better. If there was ever a true, caring go beyond duty cop it's Jack. However his efforts are thwarted by the policeman on the case - Detective Gomez who isn't all that scrupulous. However Jack Mahoney uses psychology when needed and manages to negotiate his way through. There is a whole cast of characters who have their hearts in the right place. Olivia's friends in the apartment complex Clara and Seth and others rally to the cause. Aunt Anita shows up and perhaps she is the one to take Jubilee and Paul in although Olivia has already fallen in love with them and is thinking maybe she could keep them. As well there is Sidney Klaussner and his wife Carmella, happily married for thirty years and now faced with a life and death situation that sends Carmella off onto a judgemental path of creating havoc. I was a bit annoyed with her until I owned my own occasional judgmental rants often totally lacking back up facts! This story - told from a variety of viewpoints, celebrates people with large hearts, family, kindness and love. It celebrates the truth and all that is good in people. It celebrates the courage of the human spirit and the fight for what is right. In short - a beautiful story. Sounds like a real warm, fuzzy, kind story.